Welcome to all the new families of Vardys Road Public School! 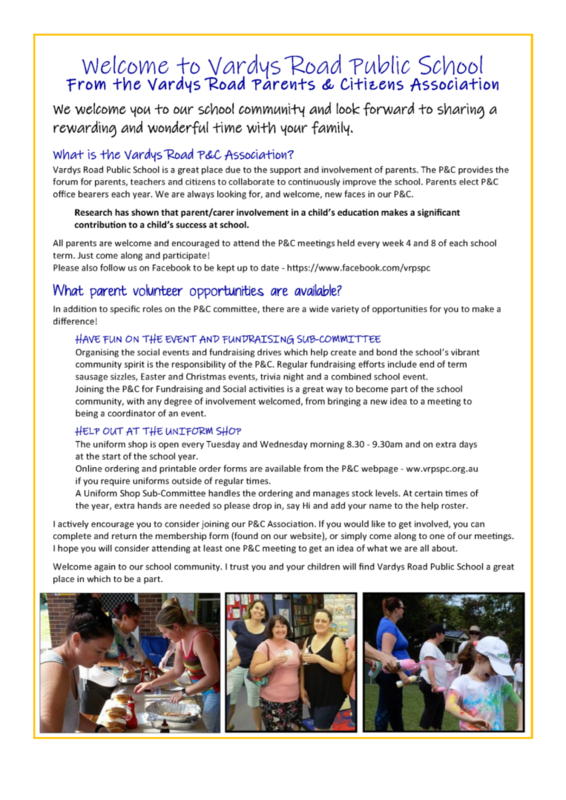 We have a wonderful school community that we would love you to be a part of. We are inviting all Kindergarten parents to Café Bayala for morning tea (provided by Wesley Mission), so that you can get to know other parents, learn more about the school community and start to feel at home here. You can meet and speak to Mr Daniel Tuckwell, our Community Wellbeing officer and Ms Diana Lloyd, our Early Stage 1 Assistant Principal. We will be hosting these morning teas every Thursday during Term 1 straight after school starts from 9:15am to 10am at our new Yarning Circle just inside our front gate. We hope you can join us for at least one of these morning teas as we are looking forward to getting to know you! When Does Homework Officially Start? 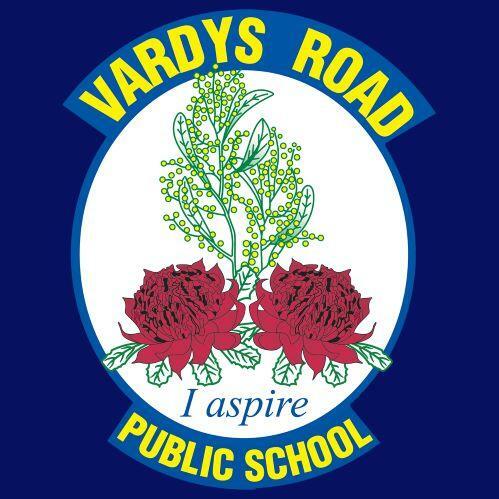 Homework at Vardys Road will undergo a review in 2019. To allow our teachers to explain how this review and trial will work at the upcoming parent information nights, the official starting time for homework will be in Week 5 of this term, a bit later than previously advertised. A great way to meet your child’s new teacher and get the year started is to attend the upcoming parent information nights. These all-important Meet the Teacher Nights will be held on 18th and 19th February at the following times. These sessions are a great opportunity to find out the routines and procedures of the class and hear about what will be taught this year. More information will be sent home soon. We look forward to seeing you there. To ensure the safety of all our children and families, the school takes care in managing the publication of student photos. 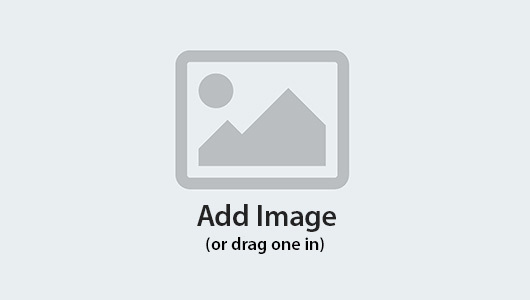 Vardys Road maintains a database of which families have given permission for their children’s photos to be published. We are in the process of updating this data base. As part of this process we will be sending home a note requesting information along with permission to publish student photos. The Department of Education’s Social Media Policy governs this process and provides strict guidelines around privacy and photo management. The school needs to publish all newsletters and notes on the internet, as well as utilizing such social media platforms as Facebook, and because of this the note will seek your permission for your child’s photo to be posted on any of these media platforms. The school asks you complete the Permission to Publish Note that will be sent home shortly. 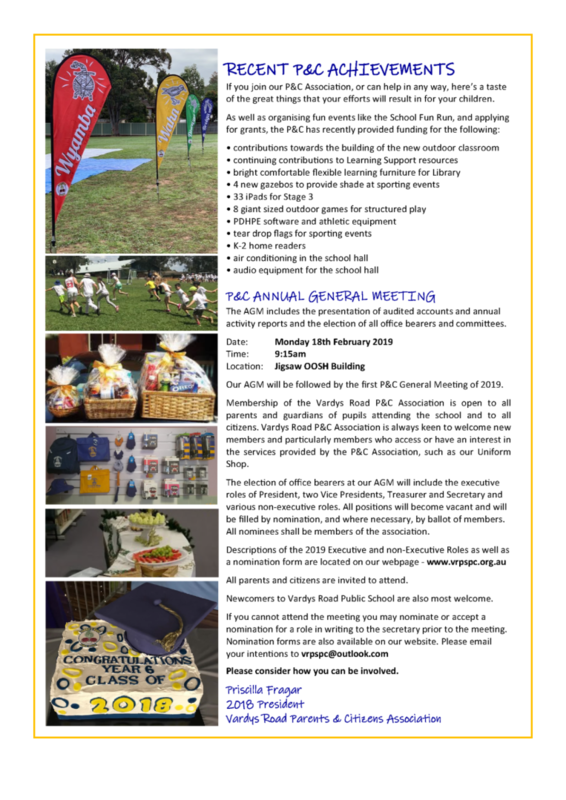 As mentioned in last week’s newsletter, over the next term we will be asking the children and the community to put their thinking hats on and start to create a picture of a mascot or symbol for our school. The mascot or symbol will not replace our traditional logo or emblem. Instead it will eventually become an image that represents our school values, aspirations and future directions. 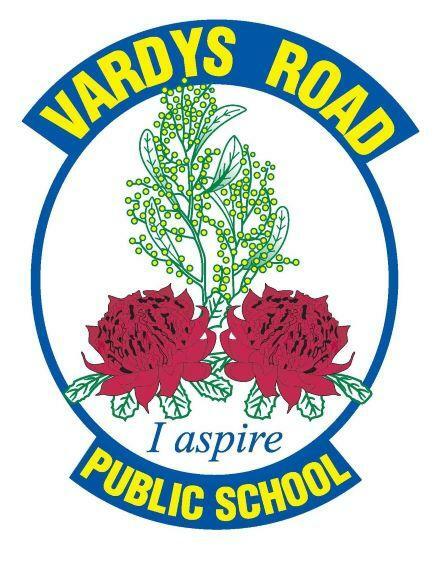 To collect as many ideas as possible, the Student Representative Council will be running a competition, asking children and community members to draw their idea and explain how their plant, animal or symbol encapsulates the Vardys Road values, aspirations and spirit. Look out for the application. It is coming soon. Vardys Road has traditionally offered many extra curricula activities and 2019 is no exception. The activities currently on offer include the following with some other activities being developed. Our String Ensemble is being reviewed to ascertain the level of interest and its viability. Auditions for these groups are currently being run. Children are encouraged to participate. This year, Vardys Road has incorporated many composite classes into it class structure. This decision was made to allow the grouping of children with similar needs, strengths and areas to develop. It facilitated student welfare programs, helped moderate class sizes and allowed increased flexibility for students to work towards challenging, differentiated and achievable goals. The structure also allowed us to better align class programs to the stage based curriculum. All the syllabus documents are stage based with children working through a cyclical program over two years. For example Year 1 and 2 students work through the same units of work, as do Year 3 and 4 students as well as year 5 and 6 children. Every class in a stage works through the same content, however attack the curriculum at different levels. This would occur in a straight or a composite class. While research has repeatedly shown there is no discernible difference in student performance or outcomes between straight and composite classes, composite classes sometimes cause concern with parents. Parental concern often centres around students falling behind academically, not being catered for and teacher workload limiting individual attention. The research however finds the opposite. Composite classes often focus more on achieving individual learning goals rather than class or grade based learning outcomes, with differing learning styles and academic abilities being addressed. Composite classes can help both older and younger students with confidence, help develop collaborative learning skills and foster independent working habits. Leadership, tolerance and cooperation are other important skills better developed in composite classes. Most importantly, a child being in a composite class or a straight class will make no significant difference to teacher workload or student outcomes; the teacher will need to be catering for individual differences in either model. Rather the most important factors on student performance and welfare are teacher student relationships, clear success criteria, comprehensive formative and summative assessment and quality explicit teaching. A child’s growth will be maximised if they know where they are on their learning journey, what they are aiming for and how they are going to get there….irrespective of their class structure. With the work we have done over the last 18 months on setting clear success criteria, setting challenging and achievable goals, strengthening learning support and Gifted and Talented Programs and building the capacity of our teachers to cater for individual differences, Vardys Road will consistently support, challenge and care for every student. We make sure every child strives for their best, thrives in a supportive environment and engages in their work. Our learning programs in all our classes, straight or composite, are planned and delivered to achieve that goal. 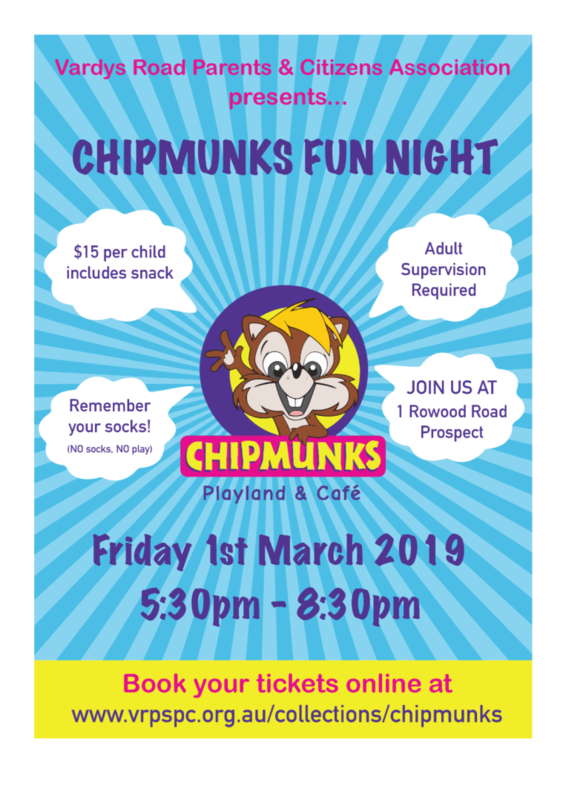 Parents who have any remaining concerns are asked to come and see their class teacher, Assistant Principals or myself to further discuss their concerns where the staff member will show how our hard working, student centred teachers will continue to develop confident, respectful and enthusiastic learners. On Friday 15th and 22nd February 2019 our Zone will be holding Zone Representative trials for a number of sports. These trials are held to select teams to represent our Zone at the Sydney West PSSA Championships. Children in Years 5 & 6 are eligible to attend these trials. Last year, we had a number of children who represented our zone at the Sydney West Championships. Trials will be held at Binalong Oval and will run from 9:30am to 12:30pm approximately. 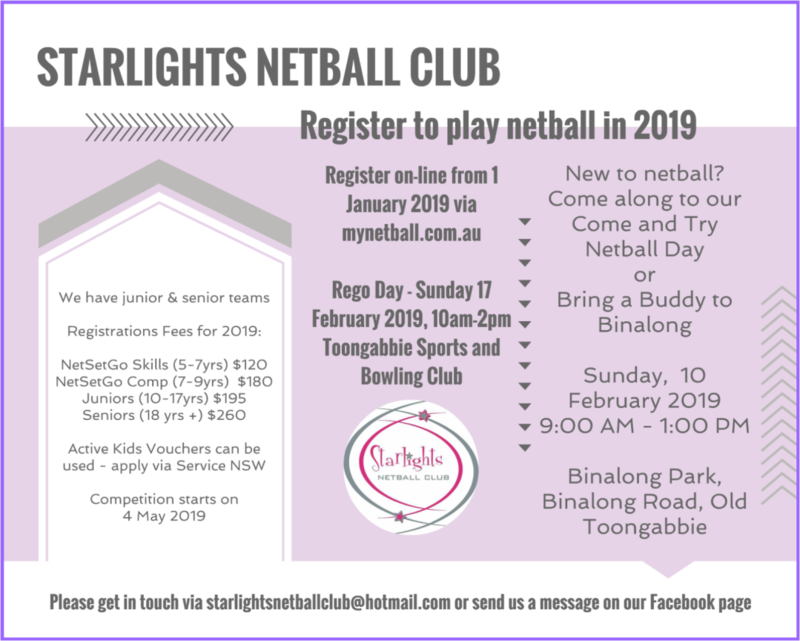 Basketball will be held at Toongabbie School. Children can trial for multiple sports on the same day if chosen. It is our Zone’s policy that we only send children who are talented athletes in these sports. A number of students whose ability in certain sports we know will be invited to trial. 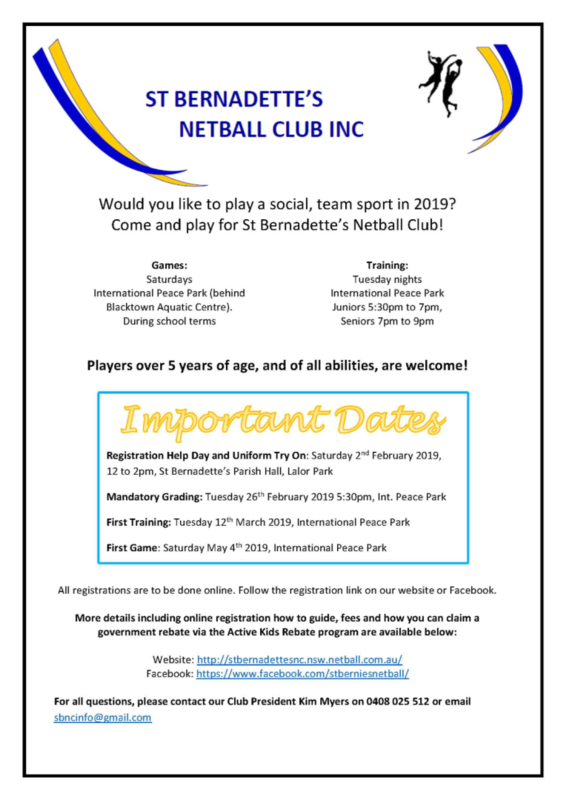 However, please contact Mr McDonald as soon as possible, preferably by email, (matthew.mcdonald3@det.nsw.edu.au) if you would like your talented child to attend one of these trials. Please be aware that we are limited to how many students we may send to these trials and that these numbers vary for different sports. Throughout the year, there will be an opportunity to trial for various other sports eg golf, water polo, tennis, hockey, rugby union etc. If your child is talented at one of the above sports, please contact Mr McDonald for details.